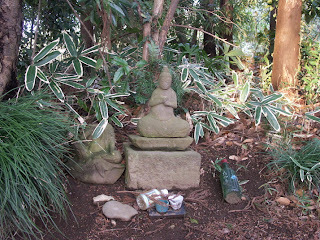 Here is another private shrine in the garden of the Ikeda Jirokichi Family. They pray for healing when someone gets a cold and offer a rice scoop (shamoji　しゃもじ) when he gets better and pray for the wellbeing of the family. This shrine is also called "Rice scoop deity", O-Shamoji sama, オシャモジ様. by this sneeze . . . Acute viral nasopharyngitis, or acute coryza, usually known as the common cold, is a highly contagious, viral infectious disease of the upper respiratory system, primarily caused by picornaviruses or coronaviruses. Common symptoms are sore throat, runny nose, nasal congestion, sneezing and cough; sometimes accompanied by 'pink eye', muscle aches, fatigue, malaise, headaches, muscle weakness, and/or loss of appetite. Fever and extreme exhaustion are more usual in influenza. The symptoms of a cold usually resolve after about one week, but can last up to 14 days. Symptoms may be more severe in infants and young children. Although the disease is generally mild and self-limiting, patients with common colds often seek professional medical help, use over-the-counter drugs, and may miss school or work days. The annual cumulative societal cost of the common cold in developed countries is considerable in terms of money spent on remedies, and hours of work lost. Shinji Ogawa believes that ochita ("dropped") means, in this context, "cured." On the first morning of autumn, Issa sees a fever-curing kind of sky. The editors of Issa zenshu^ note that okori is the mosquito-borne disease of malaria (Nagano: Shinano Mainichi Shimbunsha, 1976-79) 4.62, which supports Shinji's interpretation: the chilly autumn weather will put an end to summer's disease-spreading mosquitoes. French translator Jean Cholley notes that after Issa's fever broke, he had a dream in which he saw his dead daughter Sato; 245-46, note 124. It is seen as a legendary animal to cause disease in summer in the Edo period illustrations 絵本百物語. kakuran 霍乱 "cholera of the Edo period"
gangasa 雁瘡 (がんがさ) "goose ekzema"
***** Medicine Day (kusuri no hi)Japan. 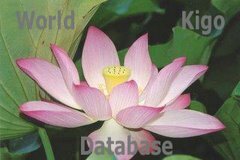 Medicine-related kigo. Chinese Medicine. Scientific research has revealed that the bacteria that causes the common cold mutates all the time, which is why we'll never really be rid of it. Does this mean it could eventually turn into a year-long all-seasons kigo? On one hand, I hope so; on the other hand, I hope not! Near the Yakushi of 台町 Daimachi there is a sanctuary for the God of Coughing. It used to be a shrine for Lord Kuruma Tsunatada, 車斯忠丹波守 (? - 1602) . He had lost a battle and tried to hide in the forest, but could not suppress his coughing, was found out and killed. After his death, he became the local 百日咳の神 "God of the whooping cough".